A hundred years ago, the Oldtime Strongmen could do those feats easily… and they established strength records that have yet to be duplicated, all a century or more before fancy equipment, miracle supplements and modern technology. After studying how the Oldtime Strongmen trained, their unusual equipment, their unique methods and anything else I could get my hands on, I can say YES, it is undoubtedly possible for you to build the type of strength they had to perform amazing feats. I know you wouldn’t have read this far if you didn’t think so too. That is one reason why I established this website: to keep many of these “old ways” alive and to pass them on to future generations. — and because strength training is one of the very best things you can do for yourself… why not do it right and have a heck of a lot of fun too? I’ll cut right to the chase: I don’t really know how it happened but modern strength training has become BO-ring. These days, what is thought of as a “cutting edge” gym has plenty of mirrors, chrome and ferns… all useless. What happened to the passion? …the attitude? …the enthusiasm? …and the Soul of strength training? It doesn’t have to be this way… It shouldn’t be this way… It won’t be this way…. The world of strength training has a long and glorious past – and we’re bringing it back. Step into our time machine and go back to the place where strength was King. You see, I feel that strength training is not just something you “do,” but a way of life. If “Real Strength” is your thing, this is the place where you will learn more about it than anywhere else. The Secrets of the Strongmen of ages past will live on through you. Lost Strength Secrets – Revealed! If you want to accomplish these amazing feats and many more like them, it will require specialized training knowledge – knowledge that can’t be found just anywhere… but it can be found here. You’ll also find vintage training techniques from the Golden age of bodybuilding, Olympic Weightlifting, Gymnastics and anything else having to do with Physical Culture. Be sure to join up for our daily email Strength Tips in the box below. 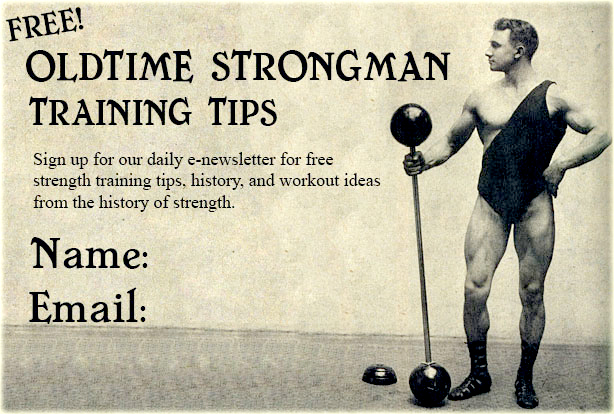 It will be loaded with plenty of great Old Time training information, classic articles, and more! – We also have plenty more surprises in store so join up today so you don’t miss out!